Today I am sharing a card I created for Dare 2 B Artzy. I am super excited to be a Guest Designer for them this month. Here is my first project. I really enjoy creating easel cards. They are a quick variation of the standard card and allow for the recipient to display the work of he(ART)! 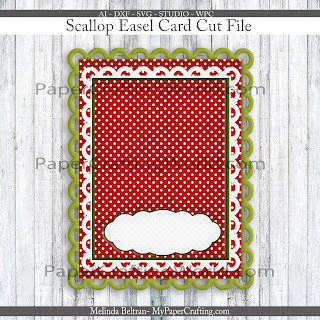 I created this festive easel card featuring the Holiday Village Stamp set. I created the card base and cut it out with my electric die cut machine. I then stamped the images and colored it with my various Copic markers. You cant’ really tell, but I did also color the background lightly with some very light blue colored pencil. I also added some glitter to various elements and then added some tiny pearl embellishments. I also used my Nuvo Crystal Drops to create the white accents around the scalloped edges as well as on the roof tops. Here is one closer look. You really can’t see the glitter too much but it is there! Here is a side view of the card standing up. To finish the inside layers, I stamped the sentiment along with some of the tiny music note stamps included in the set on a label to create a support for the easel to stand up behind it. I am sharing the SVG File I created here on the Dare 2 B Artzy Blog only and for a limited time. So be sure to pick it up while you can! Then head over to the Dare2BArtzy shop and purchase the stamp and you can make your own card too! Gorgeous card! Love your coloring! Your card is absolutely Beautiful!! !